ALL Our Schools Are Above Average! Note added Sept. 28. Upon rereading the reg. I see I overstated the requirement for denial. There is a four-year window built in at Level Two but once a school reaches Level Three, it is Accredited with Conditions. 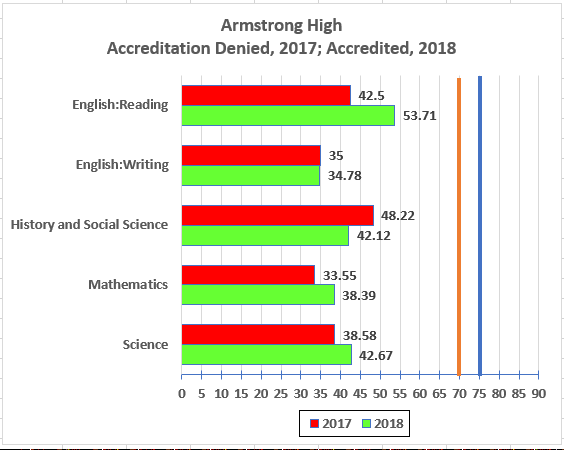 There follows a regulatory minuet but the bottom line is that the school has to tell the Board to go jump in the James to get its accreditation denied. 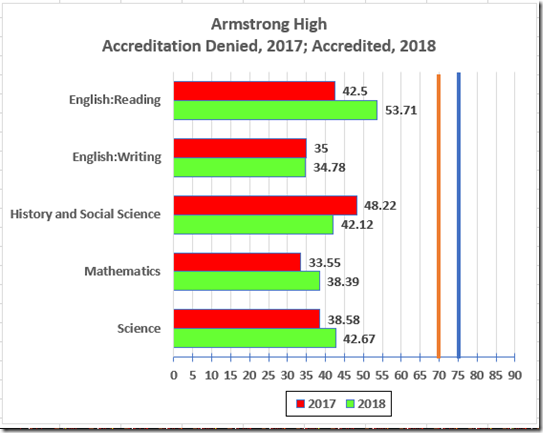 The 2019 Accreditation Results (based on 2018 testing) are up. 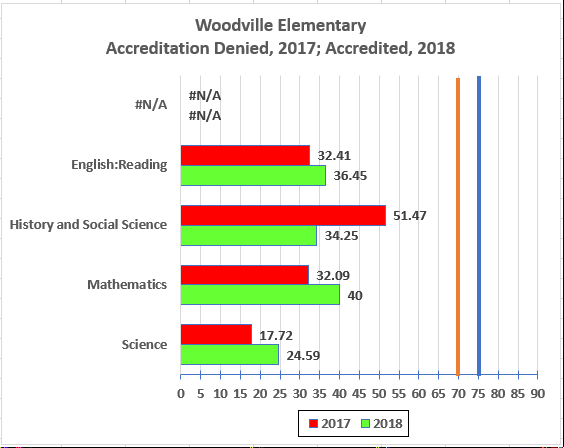 Last year, nineteen (of forty-four) Richmond schools were denied accreditation. 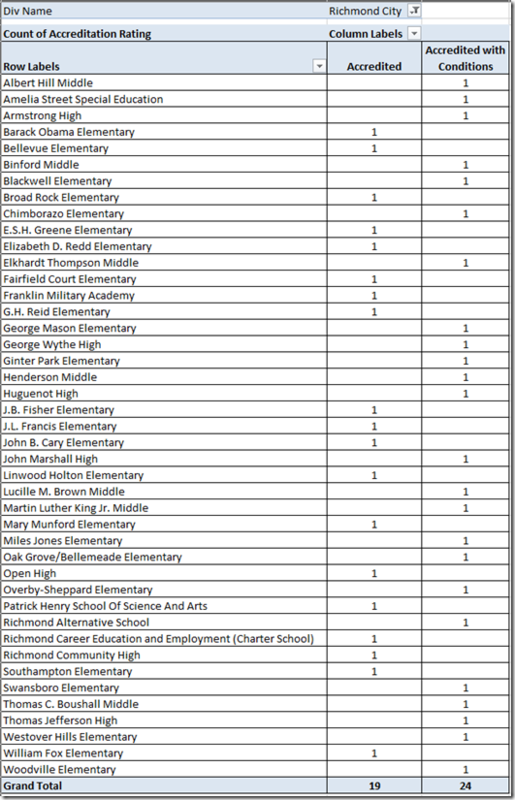 This year, all Richmond – and, indeed, all Virginia – schools are accredited! 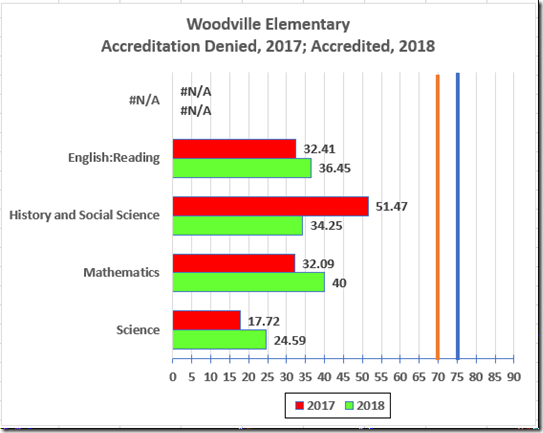 If you thought that the elimination of all those denials of accreditation reflected performance improvements, you’d be wrong. 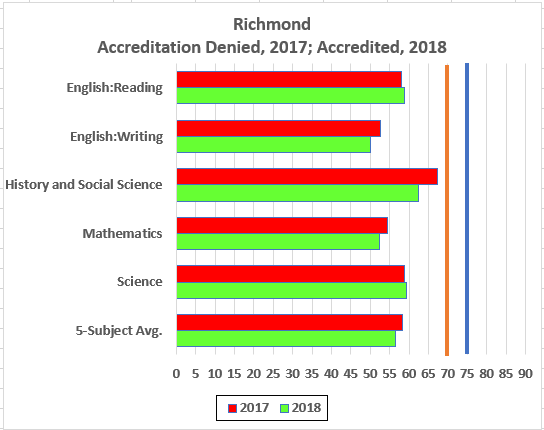 In Richmond, the reading pass rate rose by 0.73% this year, the science by 0.53; the others fell sufficiently that the five subject average fell by 1.73%. 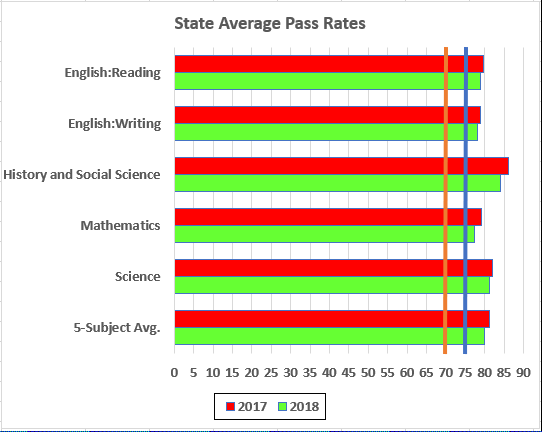 For reference: The nominal benchmark for English is 75 (the blue line on the graph); for the other subjects, 70 (the orange line). 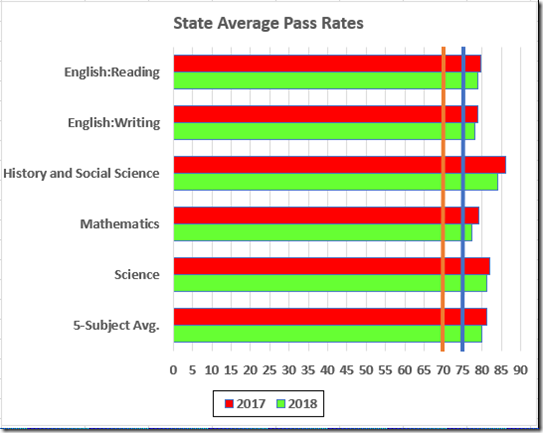 Statewide, all the averages fell. In this mixed bag of gains and losses, only one pass rate broke 50%. 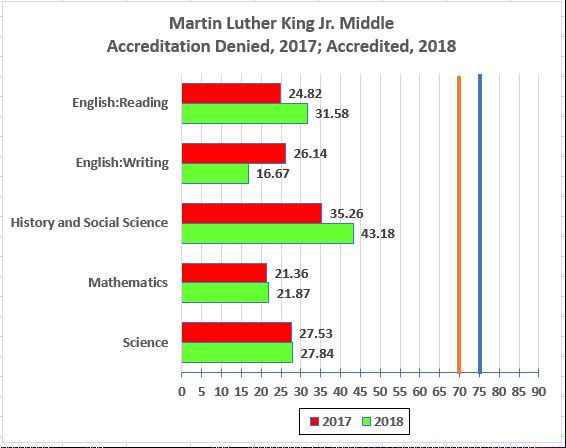 MLK, the second worst school in the state this year on the all-subject average, paints an even more remarkable picture: It’s highest 2018 pass rate was 43.18 in History and Social Science. It’s lowest, a plunge to 16.67 in writing. Note: The “#N/A” is Excel’s way of saying that the State does not test writing in elementary school and it can’t graph the nothingness. 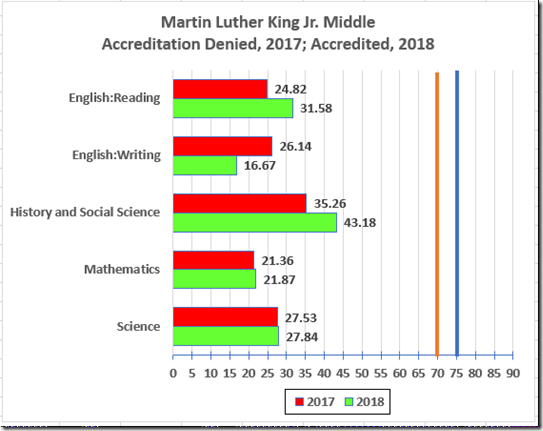 How did the Board of “Education” produce these bizarre results? It all goes back to Petersburg, which has been operating under Memoranda of Understanding since 2004 and which was denied accreditation for 2006. And has been denied accreditation ever since. The Board has demonstrated beyond doubt that it does not know how to fix Petersburg (and admitted as much, see the Sept. 21, 2016 video starting at 1:48). 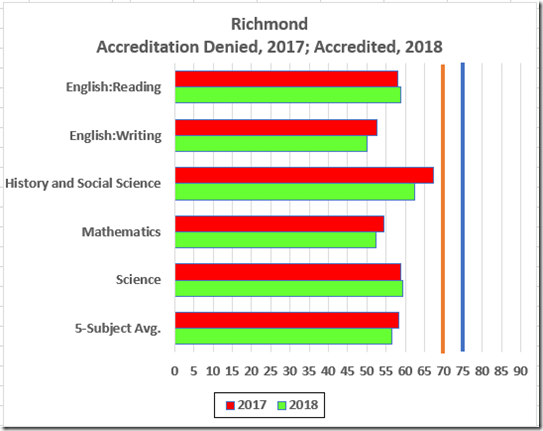 Faced now with the ongoing Petersburg debacle and with accreditation disasters in Richmond and elsewhere, the Board punted: They adopted a new, emasculated accreditation regulation. If a school does not meet a standard and does not come close to meeting it (the regulation dilutes the 75%/70% benchmarks to 66%) for four consecutive years, it falls to performance Level Three. 8VAC20-131-380.E.2. A school at Level Three must develop a “corrective action plan.” 8VAC20-131-400.D. If a school (or division) fails to adopt and implement a corrective action plan “with fidelity,” it can be denied accreditation. Id. In short, in order to lose accreditation, a school must foul up badly for four consecutive years and then tell the Board to go to hell. That is not a problem, however; that is a feature. 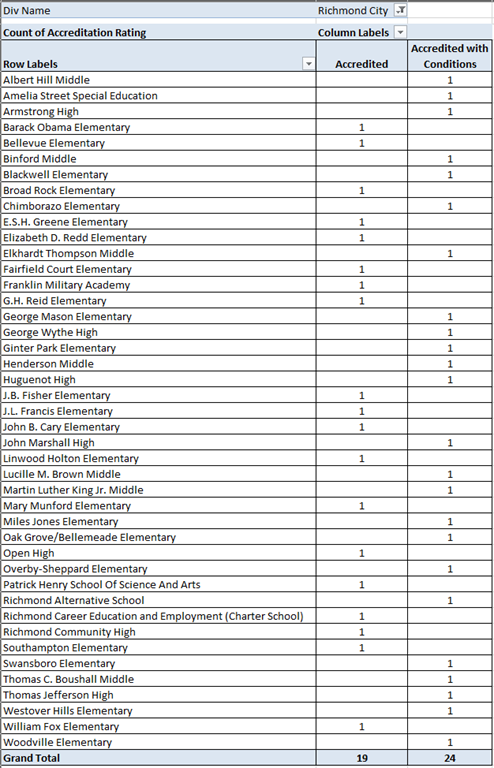 The regulation imposes a sterile paperwork smokescreen to hide the Board’s incompetence as to the inadequate schools in Petersburg and Richmond (and elsewhere). And, not at all beside the point, to make the Board and all those awful schools look better than they are in fact. Never mind the kids who are the victims of this perverse charade. Postscript: Here is the Richmond list.